The Impact of Changes in the One Child Policy in China. Causes a temporary increase of 3 million births in 2016 taking total births to 18.3 million compared with 16.1 million in 2012 (before changes). Births will be back to 2007 levels (15.3 million) by 2025. The reducing number of women of childbearing age more than offsets the increased propensity to have a child because of the regulation change. There will be 47 million fewer women of that age in a decade. A 13% decline which is inevitable. Affluence and education are changing attitudes about having more than one child thereby lowering the birth rate further. In 2013 and then again in 2016 the Chinese Government made some changes to the ‘One Child Policy’. Essentially after 2016 any couple can have up to two children where as previously there were constraints. Some assume that this will cause a wave of young persons to move through the age groups over time and boost total population and the labour force. However, reality is that it will have a relatively minor impact. Why is that? First, the ‘One Child Policy’ was not really a one child policy. A significant proportion of the population (specifically those with a rural Hukou which is about two thirds of the population) could have a second child if the first was a female. The net effect of the policy up until the changes in 2013 was that the average woman has had 1.4 children (with the second child strongly biased to males). As a result, there is already a significant number of families who already have two children and therefore cannot take advantage of this change. Of the 357 million women of child bearing age in 2016 it is estimated that 103 million have only had one child (and therefore could now consider having a second) and still able to have a second (after allowing for declining fertility by age). Also, as these women take advantage of the change in policy so the pool of women with only one child will decline. The second factor is a change in the underlying population that is inevitable. 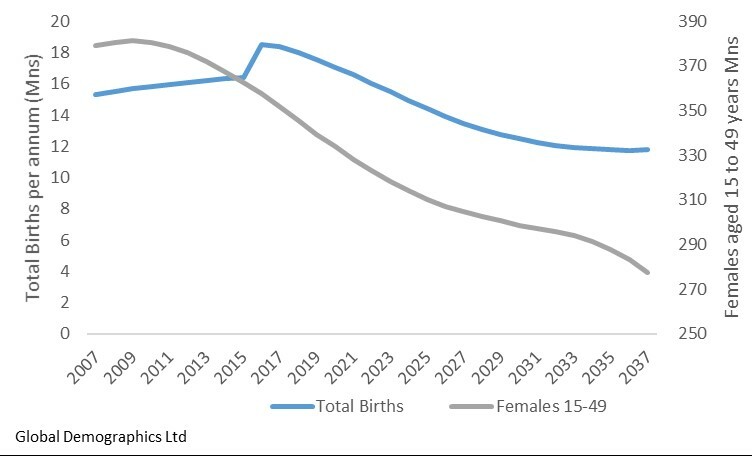 Between 2017 and 2027 the number of women aged between 15 and 49 is going to decline significantly - by 47 million to be specific – on a base of 351 million in 2017 (a decline of 13%). This is significant. It is also inevitable as these women are already alive today and the numbers in the age groups coming through cannot be varied. It is worth noting that by 2037 the decline will be 74 million women to 79% of today’s base. This leads to the third factor – that is the propensity to have children and specifically a second child. Despite the policy relaxation, it is going to decline. The reasons are multiple. First the bias of women aged between 15 and 49 is getting older reflecting the overall age profile of China. 46% of women aged 15 to 49 are over 34 years of age in 2017. By 2027 it is 53%. Older women are both less willing and less able to have children. Fertility does decline with age. Second, global observation is that the combination of increased education and affluence invariably leads to a decline in the propensity to have children and particularly more than one child. Data indicates that China is no exception. It is estimated that 70% of those who currently could have a second child have not and this will increase to 60% by 2017. The combination of these factors indicates that total births actually peaked in 2016 and will now decline steadily. From 18.3 million to 16.0 million in 2022 (which is the same as total births in 2012) and to 13.5 million in 2027. The net effect of the change is that there will be a ‘bulge of around 2 million extra persons moving through the age spectrum – 1 year olds this year, 2 year olds next, etc and that bulge will decline rapidly in size such that it will not be apparent 5 years later (i.e. the number of 1 year olds will be back to 2012 levels by 2022. So, a short-term market opportunity. As a conclusion it is worth noting this change in policy barely moves the year total population peaks – now 2028, and has no impact on the potential size of the labour force until 2031 at the earliest and probably later as children will remain in education longer by then. It might have a marginal negative impact on the labour force now as families with 2 children are more likely to have a stay at home parent than a family with one child.